It seems the next iteration of food trucks has struck. The ATM trend has finally hit the UK in the most unlikely place. 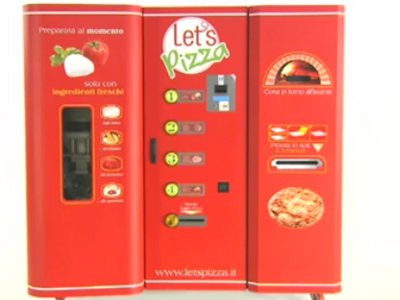 We are all used to getting our drinks and bars of chocolate out of a machine, but that transition into freshly made food is a leap which we are apparently starting to make. Only yesterday, I was waiting to board a plane to Cape Town and at the gate you could get drinks, snacks but also ice cream from a vending machine and interestingly it was the men who purchased one not only for their kids, but themselves. 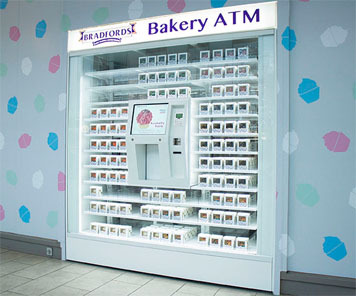 Bradford Bakers launched a cupcake ATM at the end of last year in, of all places, a shopping centre in Glasgow. The machine is filled fresh daily from the bakers and is the first bakery ATM in the UK. Now they are up for an Opal innovation award organised by the British Council of Shopping Centres. 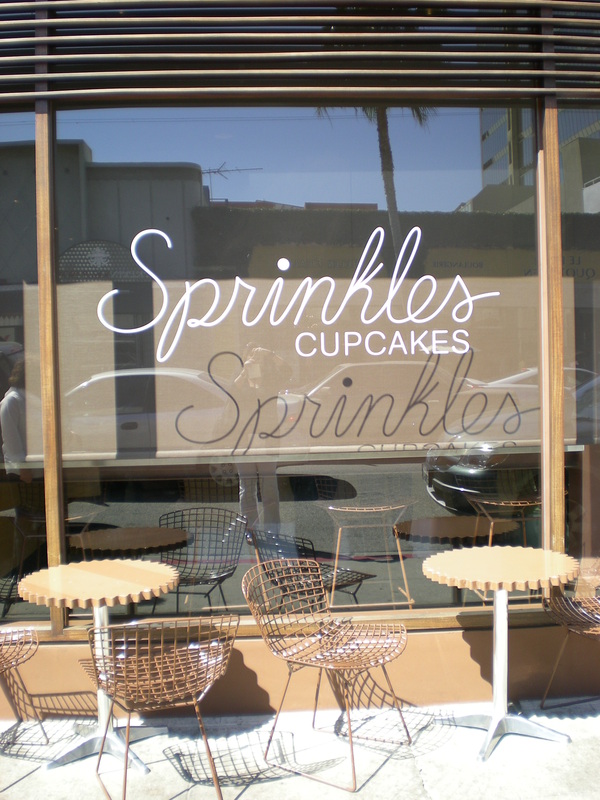 I guess their inspiration came from the iconic Sprinkles cup cake mecca in LA. 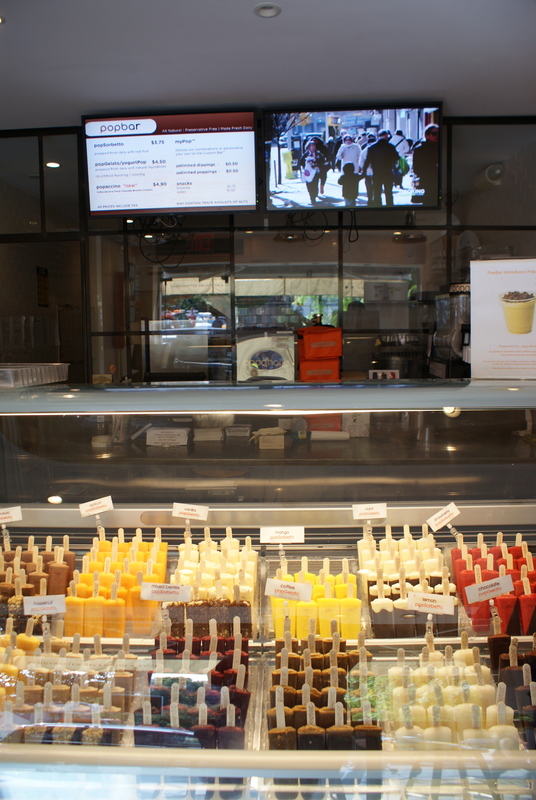 They opened their ATM just over a year ago in March 2012, closely followed by an ice cream concept. These guys as ever lead the way. The fascinating thing to me is the branding which is clearly just leagues ahead in the USA. These pics show it plainly in terms of creating a brand with colour, design, texture and just so much more to capture the imagination. Why don’t our retail designers set standards in the same way our fashion designers or architects do? 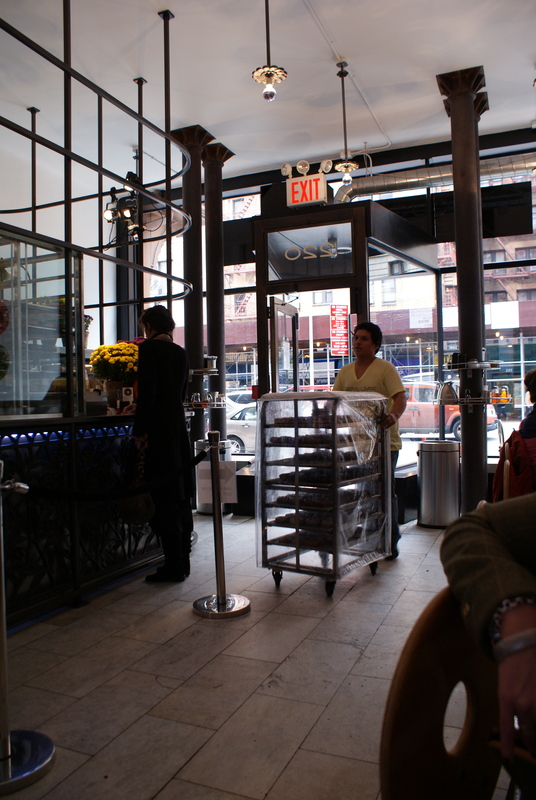 Whilst bakery seems to be the easiest option for food ATM’s there are also a couple of others that have been seen around in the USA, namely hotdogs and pizza. Will it catch on? It’s kind of suicide for me to know that a wonderful cupcake is available 24/7 but I guess in 20 years time we will all be grabbing a bite from some branded robot. For now, I prefer a freshly prepared something cooked fresh in a kitchen….what about you? 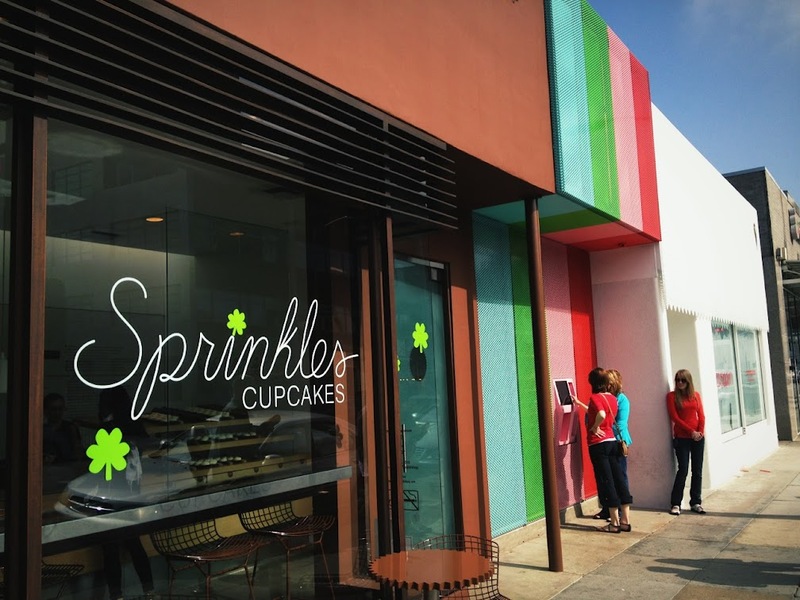 I read today that Sprinkles in LA were launching a cupcake ATM which is reported to be able to dispense cupcakes for humans and dogs 24 hours a day! 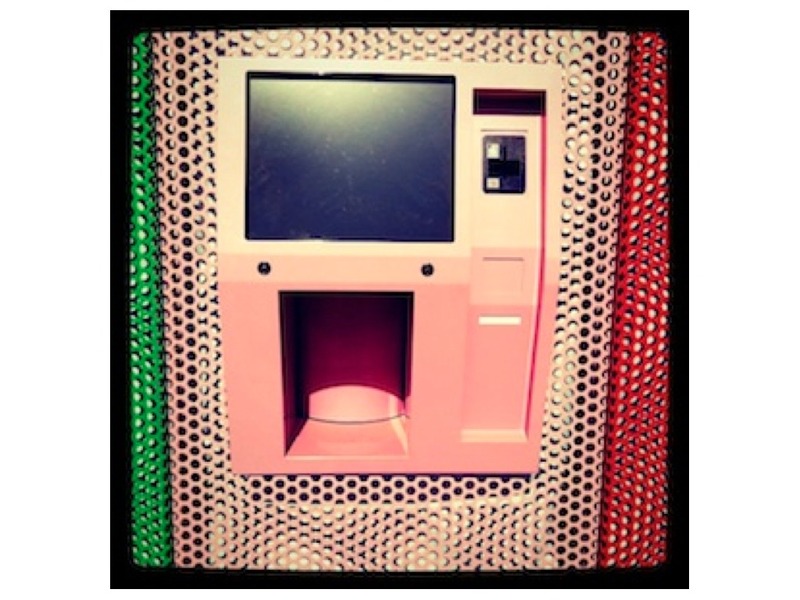 If you are interested this ATM has its own facebook page too… and will be opening next to the new Sprinkles ice cream parlour. This got me thinking about the whole cupcake phenomena and its value to the food industry. 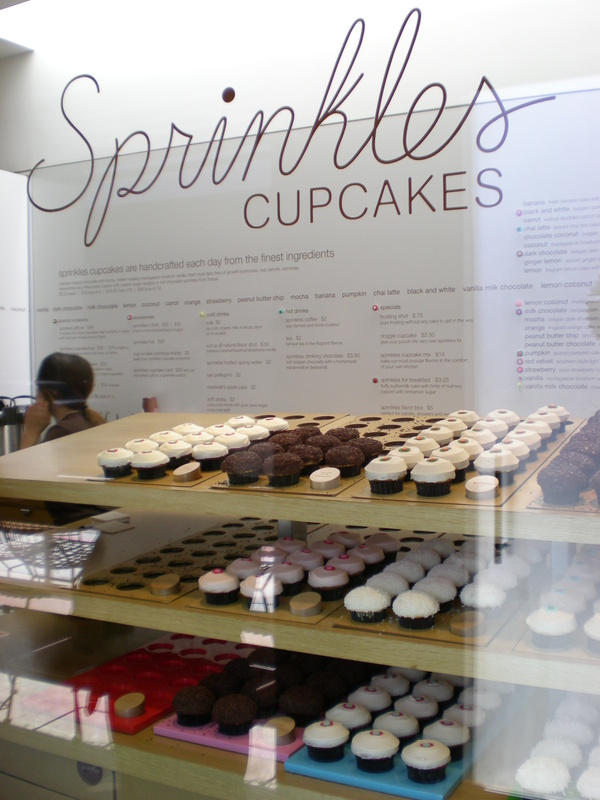 I was taken to my first real cupcake experience by my wonderful friend Bonnie at Sprinkles in LA and it has stayed with me for some time. They just get it right here. A small outlet which is themed with cupcake shaped tables and chairs could potentially be cringe worthy to a cynical Brit like me, but somehow it worked. I think it was the fact that the cupcakes themselves were very elegantly designed with their simple colour coded decorations and the shop was understated and contemporary. Well, it was this and the fact that the cupcakes themselves are just wonderful. Freshly baked, light, soft and just the right balance of icing. It pretty much defines treat for a sweet toothed girl like me. 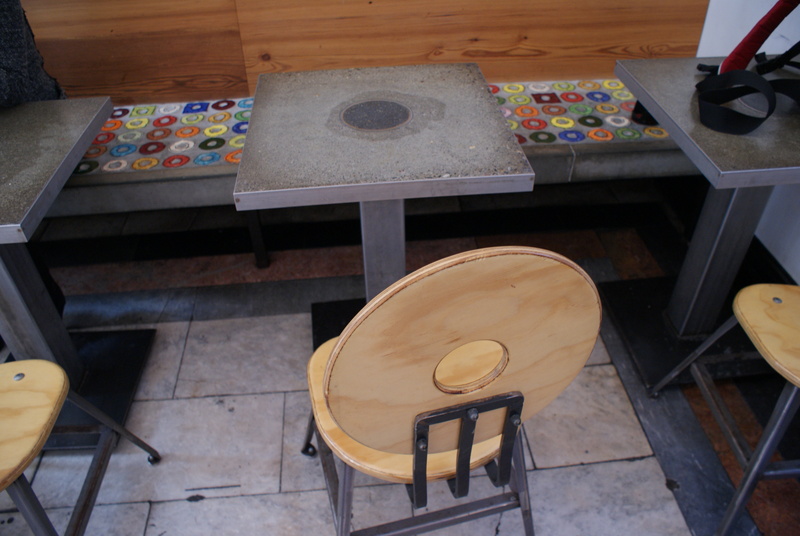 NB: the cupcake edges tables! There have been way too many column inches written about the cupcake, their future and the next thing to replace them. I am sure it would be wonderful to discover something that could make a similar commercial business but the truth is that can never happen. It is much more interesting to realise why the cupcake was so successful and to respond to that customer need instead. This is all about a small, pretty, girlie treat that also fills that 3pm desire for something sweet. It has to be naughty but it also has to feel contained. This is a very specific need that is actually quite difficult to put into words. The whoopie pie was the first pretender to the cupcake throne and one I never really understood. It is too heavy and doughy as well as lacking that cute design that is so inherent to the experience. Cake pops also emerged at this time but they simply did not have enough substance and were way too fiddly to be taken seriously. Then there was Le Macaron. In fact, one could argue that the macaroon was the pre-cursor to the cupcake and that it has never needed to compete. I certainly adore Laduree and often find a box of those on my perfect gift list, to both give as well as receive. Their packaging is stunning and the product when made well is just a heavenly bite of whatever flavour you choose. The salted caramel and liquorice flavours procured at Burlington Arcade Laduree certainly do it for me. But the sad truth is that I could wolf down at least a whole box of 4 without even noticing and this breaks all the rules of the cupcake as it ventures into the whole psyche of guilt which just cannot end happily. 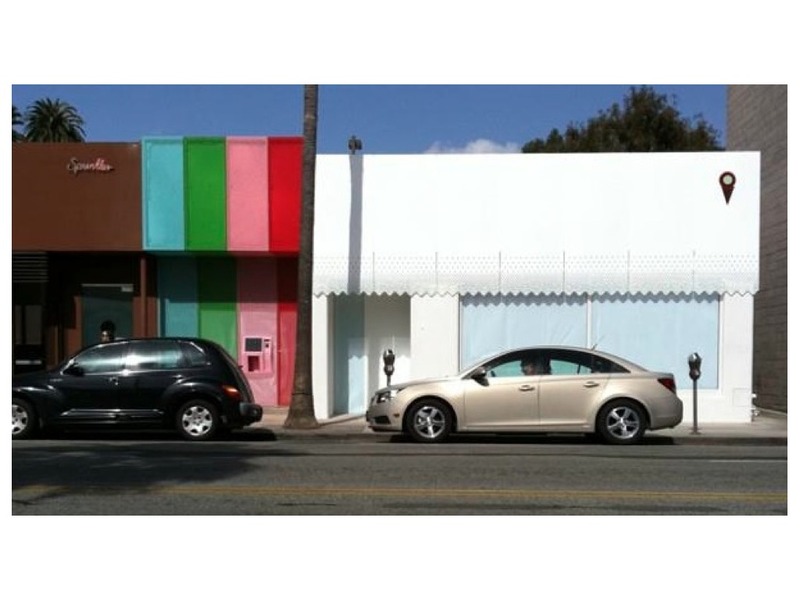 ‘Lette in LA opened round the corner from the Beverly Hills Sprinkles and are still going strong. They really tapped into the contemporary treat and are a good example of a macaroon shop, winning awards for their shop design as well as a dedicated following for their colourful product. More recently we have seen a resurgence of the doughnut, and a fine resurgence it is. This is no cupcake but it certainly holds its place in the treat market. We all remember the original Krispy Kreme story and Greggs the bakers have heralded their doughnut range pretty much as the saviour of their business last year. 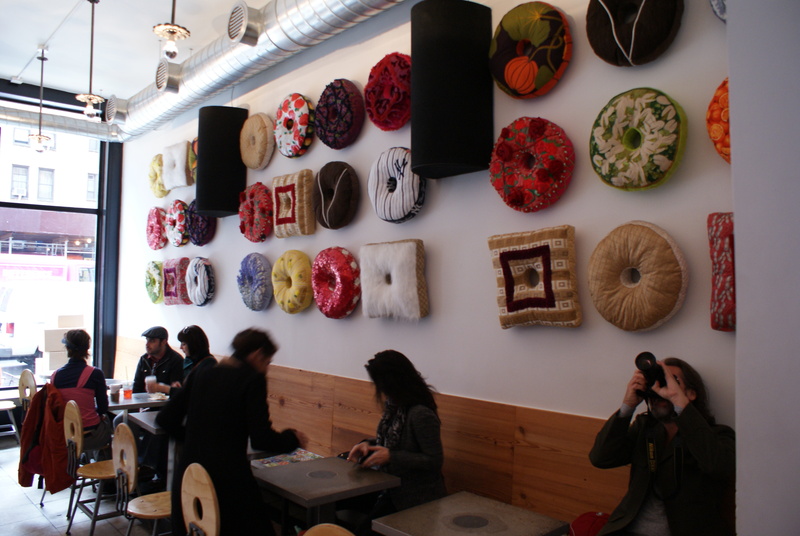 In New York, I really loved discovering The Doughnut Plant and it reminded me of Sprinkles in some ways as the shop was contemporary in a New York shabby chic kind of way as well as having that sense of fun in the seating area. The product was also a very good one for the doughnut lovers out there but anything that is fried and doughy will never make is as a treat for the ladies who lunch. Ice lollies are certainly more worthy and I have seen many great examples of ice lolly shops in various parts of the world, including Australia, New York and Cape Town. Whilst they are a perfect antidote to the heat of those places, they are definitely too goody-two-shoes to be in the cupcake category of 3pm treat. 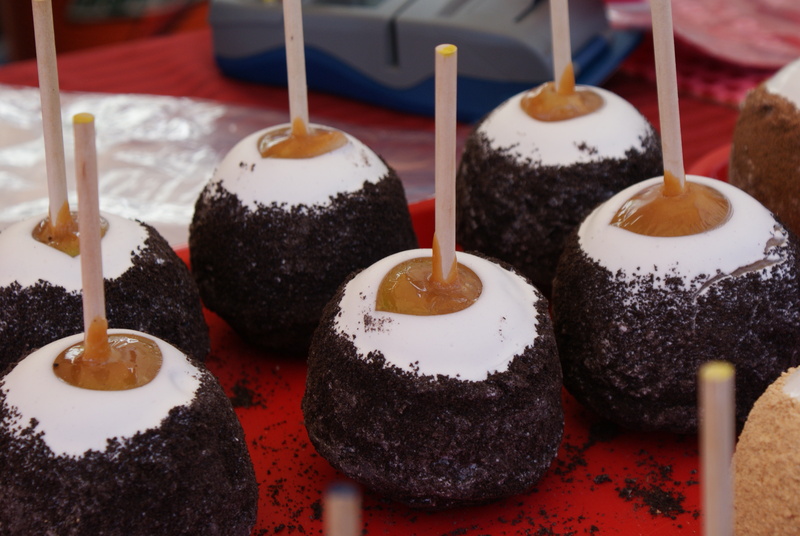 My final discovery in the sweet treat market which hasn’t really taken off outside of the US are toffee apples. For those of you that know me, I have been talking about these for some time now and do think they are an opportunity, especially in the Autumn using the wonderful new seasons apple varieties we have in this country. I keep pondering how a small pink Discovery apple would be transformed by a coating of soft chewy caramel toffee….. but then again they are far too difficult to eat to take over the elegance of the cupcake.